12-input digital field mixer with 16-track integrated recorder and timecode. With 12 true inputs (6 mic inputs and 6 line inputs), the 688 offers more than enough fader control for bag work. 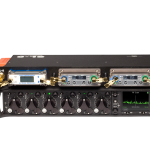 Add the optional SL-6 integrated powering and wireless system, used with SuperSlot-compatible receivers, and the 688 gains complete Rx control and monitoring, plus RF scanning and frequency assignment, all from the 688’s larger color LCD. 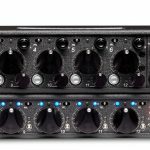 Its eight assignable outputs (L/R, X1-X6) provide vast routing flexibility, allowing sound mixers to easily tailor their setup to the various configurations necessary while on location. Channel assignments are a breeze. Add the optional CL-12 linear fader controller, and the 688 becomes a very powerful, fully cohesive cart audio system with smooth-gliding faders, 3-band EQ, dedicated controls and LED metering. 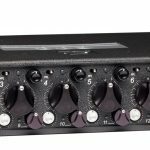 The 688 has six high-bandwidth mic/line inputs on XLR connectors, each complete with phantom power, high-pass filter, analog input limiter and variable pan. 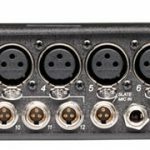 Six additional line-level inputs on TA3 connectors offer flexibility for more complex productions. All inputs are assignable, pre- or post-fade to its eight output buses, left/right plus Aux 1-6. 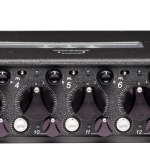 The 688 can send its main left/right mix to three cameras simultaneously via transformer-balanced XLR and Hirose outputs. 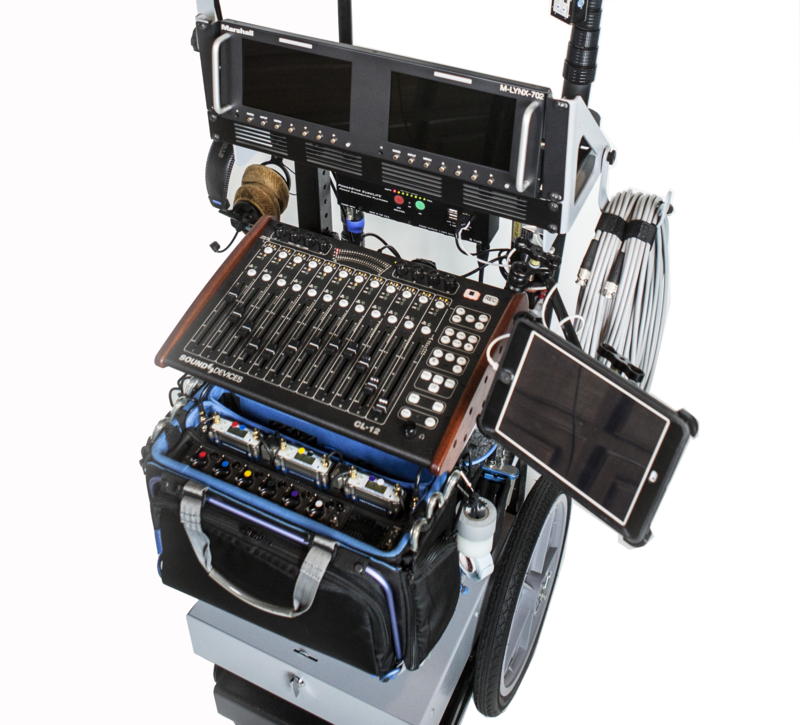 In keeping with Sound Devices’ commitment to giving production sound mixers the tools they need to help them mix in increasingly complex production settings, the inclusion of the Dugan Speech System™, along with Sound Devices’ MixAssist™, makes the 688 the ‘go-to’ automixing tool for field production applications. Automatic mixing is widely used in broadcast television applications, in dialogue recording for TV and motion picture production, and in house of worship (HOW) applications. It also is a good choice for teleconferencing, video trucks, and theater applications with multiple wireless microphones on stage. 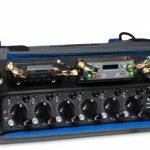 Dugan automixing takes over the nerve-wracking job of cueing mics in and out, freeing up the location recordist to pay more attention to the artistic balance. 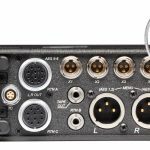 MixAssist automatically attenuates the level of inputs that are not active and helps maintain consistent background sound levels regardless of the number of open microphones. Comb filtering and phasing artifacts are also reduced when multiple mics pick up the same sound source by intelligently attenuating redundant mics. The end user can define the amount of off-attenuation MixAssist uses. The 688 offers 16-track, polyphonic or monophonic broadcast WAV file recording to SD and CompactFlash cards. 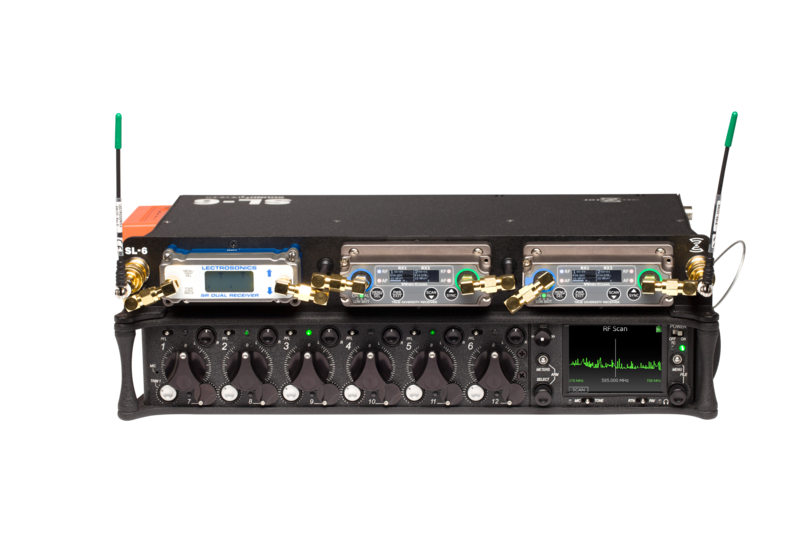 All common sampling rates are supported, including 192 kHz on up to six tracks. The memory cards can be set independently, recording either identical material for real-time backup, or combinations of WAV and MP3 files. 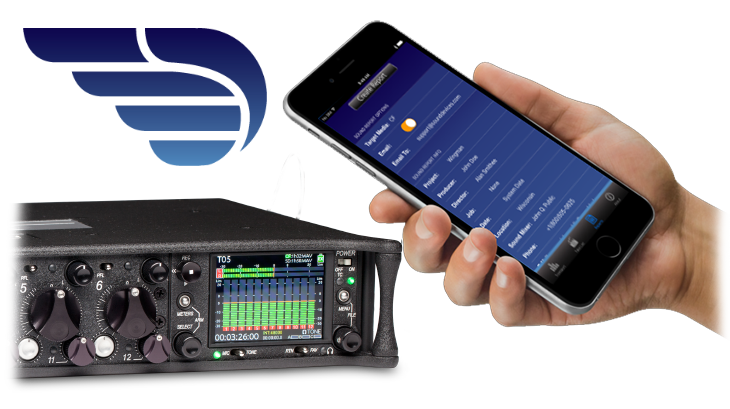 The 688 features a world renowned Ambient™ timecode generator and reader supporting all common rates and modes. A helpful time code compare utility shows the difference between internal and external timecode. 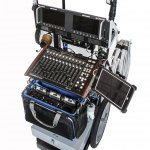 The 688 also generates sound reports and supports extensive metadata, via the front panel or attached USB keyboard. Click Here to learn more about Wingman. The 688 incorporates exclusive PowerSafe circuitry with smart sensing of available power sources, front panel warning indication of power loss, and an integrated 10-second power reserve that will, in the event of an inadvertent power loss, allow the 688 to safely stop recording, properly end all file operations, and then automatically shut down. Power on and start recording in less than two seconds. You never have to wait on sound. 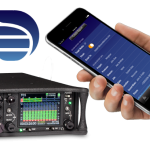 Sound Devices 6-series mixer/recorders support third-party solutions including Ambient™ Recording (along with Lockit Network GmBH) and Timecode Systems (with PureBlend Software). If you currently have the necessary gear from Ambient, additional investment should be nominal. You can learn more by visiting Ambient’s website. Our firmware updates are free to our customers. If you have questions about the necessary equipment for either solution, click HERE. For questions on pricing and where to purchase gear/software from either Timecode Systems, Ambient, or PureBlend Software, please contact them directly as they will be able to best answer any questions about their solutions. One-year standard warranty turns into two-years upon registration. Click Here for more information. Auto-Mute feature provides the option of automatically silencing the X1-X6 outputs when in stop mode. SL-6 SuperSlot support of the Lectrosonics SRc-941. SL-6 SuperSlot support of RF scan between 941-960 MHz for the Lectrosonics SRc-941. Audio Limited A10-RX Orientation menu control from the 688. Audio Limited A10-RX Menu > Settings > Orientation is no longer automatically set to Normal by the 688 at power up. This change is to accommodate the Audio Limited A-FLIP accessory. Rare event where takes disappeared after renaming has been eliminated. Intermittent lockup that affected a limited range of 688 hardware revisions when combined with the SL-6 no longer occurs. The CL-12 does not always initialize when connecting to the 688 if the CL-12's DC Boost Input is connected. Workaround: When disconnecting the CL-12 from the 688: Remove the DC Boost Input micro USB cable before disconnecting the CL-12/688 USB A to USB B cable. When connecting the CL-12 to the 688: Connect the CL-12/688 USB A to USB B cable before connecting the DC Boost Input micro USB cable.